HomeThomas Ballard of James City County, Virginia (1630-1690).Thomas Ballard, Jr of York County, Virginia (c.1655-1710).Matthew Ballard of York County, Virginia (c.1685-1719). On 20 November 1716, “Andrew Elsmey, Math Ballard & Jno Gibbons of York Co. are firmly bound unto ye justices of York Co for 400 pd”, providing security for Andrew Elsmey as guardian of Jno Brook, orphan of Eliz Brooke, dec’ed.4 On 16 March 1718/9, he and Wm Sheldon “gent. justices” were recommended to Lt Govr. Henry Hayward as “fitt & capable to execute the office of Sheriff for the ensuing year.”5 This was not to be, however, for he fell ill the next May, wrote his will 13 May 1719, and was dead by 18 May 1719 when it was presented to record. Mathew Ballard of the Parish of York Hampton, York Co. My desire is that the grave yard or usual burying place in the orchard be walled in with brick & that the dwelling house & young orchard be kept continually in repair for the benefits & advantage of my heir. I give one suit of my wearing cloths to Henry Blackgrove & the rest of my wearing apparell I give to be divided between my brothers Robert & John Ballard. I give all my lands, Negroes, money, plate, cattle, sheep, debts & other estate whatsoever in Virginia or elsewhere to my son Matthew Ballard & his heirs, & in case he should happen to die without such heirs then I give my land, Negroes &c. to be devided between by brothers Robert Ballard & John Ballard & their heirs, but in case my brother Robert should refuse to permitt my brother John quietly to enjoy the ½ part of my lands [moiety7] then it is my will & I do hereby give & devise all my Negroes & personal estate to my sd brother John Ballard & his heirs. 1. York Co. Va. Deeds, Orders, Wills, 1701-08, p. 166. 2. York Co. Va. Deeds, Orders, Wills, 1706-1710, p. 254. 3. 15 August 1715. York Co. Va. Deeds, Orders, Wills, 1713-29, p. 81. 4. York Co. Va. Deeds, Orders, Wills, 1716-1718, p. 46. 5. York Co. Va. Deeds, Orders, Wills, 1718-20, p. 394. 6. 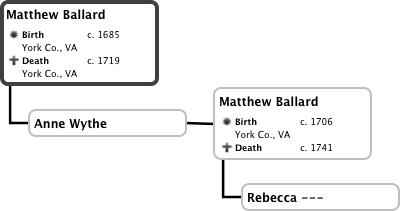 John M. Weisner has proven the identity of Matthew Ballard’s wife; see English Origins of the Ballards of America: The Ballards of Virginia, Maryland and North Carolina. The 1674 sale of 500 acres of the Northumberland county land (now in Westmoreland county) states that the former owner John Sheppard had resided at Harris Creek in Elizabeth City county and that he had willed the land to his son Baldwin and daughter Elizabeth. The sellers are recorded as Baldwin Sheppard of Harris Creek in Elizabeth City County, Quintillian Gotherick of Kequotan and his wife Elizabeth Gotherick, the daughter of John Sheppard. Westmoreland Co. Deeds, Patents, Etc. 1665-1677, pp.205a-207; Westmoreland Co., Virginia Deeds, Patents, Etc. 1665-1677, Part Three, pp.14-15 (Washington D.C., 1974). After the death of Quintillian Gutherick (1689-90), Elizabeth married Thomas Wythe, Jr (died 1693-4) and later wed (1695) Rev. James Wallace. Her two children with Thomas Wythe, Jr were Thomas Wythe and Anne Wythe. This Anne Wythe, the granddaughter of John Sheppard married Mathew Ballard, the son of Thomas Ballard, Jr. See “Wythe of Elizabeth City” in John Bennet Boddie, Virginia Historical Genealogies (Baltimore: Genealogical Publishing Company, 1975), pp. 122-25. In her will dated March 14, 1739, Anne Sheppard/Gutherick/Wythe/Wallace mentions her grandson Mathew Ballard (Lucy Ballard, possibly the daughter of Francis Ballard, was a witness). Elizabeth City Co. Deeds, Wills, Bonds, Etc. 1737-56, p.99; B. A. Chapman, Wills and Administrations of Elizabeth City County, Virginia, 1688-1800 (Baltimore, 1980) p. 98. Ten years earlier, in 1729, when her son Thomas Wythe, died, he also mentioned the same Mathew Ballard as his nephew in his will. See “Wythe of Elizabeth City,” p.124; Elizabeth City County Deeds & Wills & Orders 1704 -1730, p.188, Wills and Administrations of Elizabeth City County, p.107 (Will of Thomas Wythe (abstract). To wife Margaret my slaves except those hired to Robert Ballard of York County; son Thomas; son George; daughter Ann (all children under 18); my nephew Mathew Ballard; brother James Wallace; mother Ann Wallace; debts due Cole Digges and Major Lightfoot to be paid. Witnesses: John Tabb, Sarah Walker, Abraham George. Dated 3 November 1728, recorded 15 October 1729, Elizabeth City Co. Va. Book 1704-1730, p. 188). 7. Black’s Law Dictionary defines “moiety” as “a half of something” (such as an estate). 8. Dated 10 May 1719, recorded 13 May 1719, York Co. Va. Records, Book 15, p. 429. Inventory produced & admitted to record 17 August 1719. York Co. Va. Records, Book 15, p. 471. 9. York Co. Va. Deeds, Orders, Wills, 1718-20, p. 479. 10. 18 May 1741. Rebecca Ballard, widow of Matthew Ballard, dec’d., renounced her right to the administration of the said dec’d estate. Philip Lightfoot is appointed administrator. York Co. Va. Records, Book 18, p. 8. 11. York Co. Va. Wills & Inventories, 1718-1720, p. 568. 12. York Co. Va. Wills & Inventories, 1737-40, p. 463. 13. York Co. Va. Deed Book, 1729-40, p. 528. 14. York Co. Va. Wills & Inventories, 1737-40, p. 590. 15. York Co. Va. Deed Book, 1729-40, p. 615. 16. York Co. Va. Deed Book, 1729-40, p. 616. 17. York Co. Va. Wills & Inventories, 1740-43, p. 26. 18. York Co. Va. Wills & Inventories, 1740-43, p. 219.